I didn't like Metroid II much as it had no balance between action/exploration (the spider ball is the trademark item in this game and it made exploration really great). I've also seen much detailed graphics on old black and white Game Boy games in the past, but this game had some well-designed areas and I just loved the ending with the baby metroid. Nintendo's old R&D1 team had showed a much greater effort with games like the first Wario Land for the classic handheld system, which amazed with it's brilliant level design and art style. 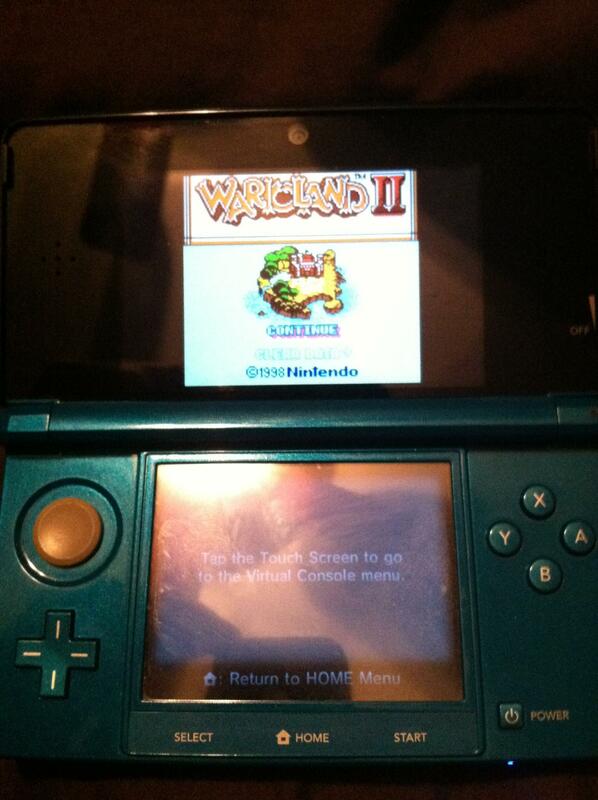 Makes me consider having Wario Land 2 on the go. I recommend Dig Dug (NES), the NES port of Dig Dug is way more faithful to the original arcade game than other NES ports of Namco arcade games, and the 3DS VC version actually saves high scores. Plus, Dig Dug wasn't included on Namco Museum DS even though Dig Dug II was. Zelda 2 is easy to recommend now that it has restore points available. But be warned that the difficulty is HIGH and unbalanced. If you don't mind dealing with being lost sometimes and those other issues don't bother you then I'd say go for it. Thanks! I'll have the difficulty in mind. I like some of the art style in the game and do think there is a wide variety of enemies to encounter along your path to save Hyrule once again. Definitely considering it. Tell me about Sonic the Hedgehog: Triple Trouble? I am thinking of purchasing it sometime. Also, how many memory blocks does it require? Thanks! Also, the 3D Classics line are NOT VC! They have never been featured in the VC section (They're kept in the 3D Games section), On NOJ's website they're stored with the other eShop downloads (instead of with the VC games), and they are ported to run on the 3DS itself with added features not found in the original releases (while VC titles run on emulators, and are exact replicas of their original releases). To be perfectly honest, I've never enjoyed the NES Zelda games. Or even the first couple of Metroid games. Those series, for me, only started getting awesome once they hit the Super Nintendo. It's a solid classic 2D Sonic game. It's not as great as the Genesis games, Sonic CD, or Sonic Advance, but it's an enjoyable portable platformer. I think it's one of the Game Gear's best. It's 52 blocks. I personally think Shinobi is one of the best games on the VC right now with its Shinobi meets Mega Man gameplay style and variety. I hope they eventually get around to putting up the sequel. Thanks! I purchased Sonic the Hedgehog: Triple Trouble from the Nintendo eShop! It's great! I highly recommend it to all Sonic fans! Zelda II is sick! So I decided to treat it like an RPG and go for experience points early on in the game. Headed towards the 4th dungeon and got the Attack and Health boosted up to 7. Magic is at 5 (beginning to realize that it's slightly more important than the Health because of the Shield and Life (Heal) spells). The Iron Knuckles are a huge pain.. I got into GB Tetris over Christmas. I must've had a go on the original at some point, I never owned a Game Boy. WIth 5 minutes here, 10 minutes there, my Activity log says I've racked up 26 hours on it. A great game. I downloaded and completed the first two Mega Mans (Mega Men?!) and enjoyed them. Again, I'd never played them before, though I loved Chip and Dale on the NES and the engine and feeling with the great music really carried over. However, if these games weren't on 3DS I would probably never have played/completed them because they're bloody difficult (read: I'm crap at games). I don't have the time to devote to playing them repeatedly, not when there's so many great games coming through (Luigi's Mansion, Fire Emblem, ANIMAL CROSSING!!). I finished the original Zelda last year, and there's no way I'd have ever got round to that without portability and restore points. 3DS is racing to the top of my most played console ever because it's so damn handy. Just got Wario Land: Super Mario Land 3, Kid Icarus: Of Myths and Monsters, and Blaster Master: Enemy Below. Good choices? I'm having trouble deciding on one game between Zelda II, Mega Man 4, Legend of the River King and Mario Golf. I didn't enjoy Zelda II the last time I played it, but I'm willing to give it another chance; the other three are games I've never played before, though I love MM2 & MM3 (just beat 3 the other day) and I enjoyed Camelot's GBC/GBA Mario Tennis games. EDIT: Went with Zelda II. Do GB games have the save state feature? @DarkCoolEdge Yes, the GB games have a restore point save feature as well. I would really recommend Mega Man 3 and Kirby's Dream Land 2 out of these. Gargoyle's Quest is another one, but requires more platforming skills (mostly from trial-and-error runs).